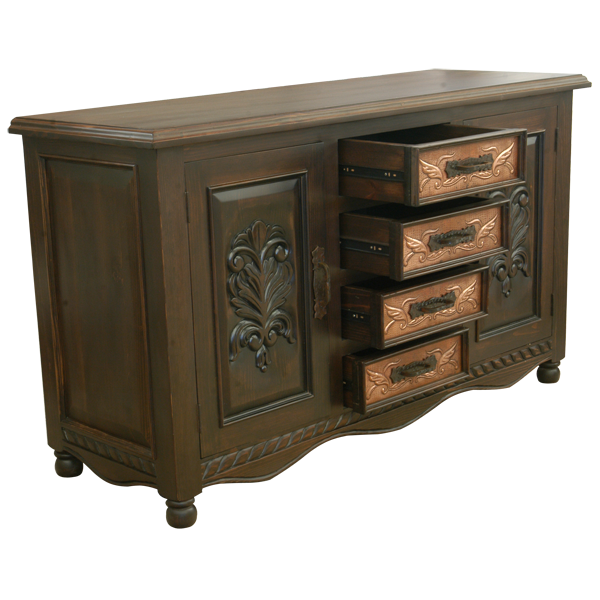 The combination of opulent, hand tooled copper designs and intricate, hand carved, floral details create a luxurious, handcrafted, Spanish colonial style credenza. 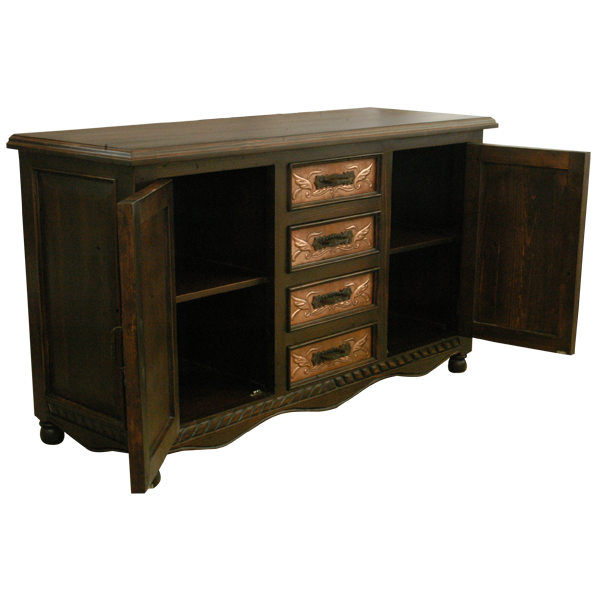 The credenza has a large, wide top, with a classic, straight top rim. Directly below the top and centered in the front of the credenza are three, spacious, vertical, rectangular drawers. Each drawer is covered with an exquisite, hand hammered and hand tooled copper panel, and each copper panel is embellished with lovely, hand tooled, floral designs. Each drawer has a hand forged, iron handle in its center. 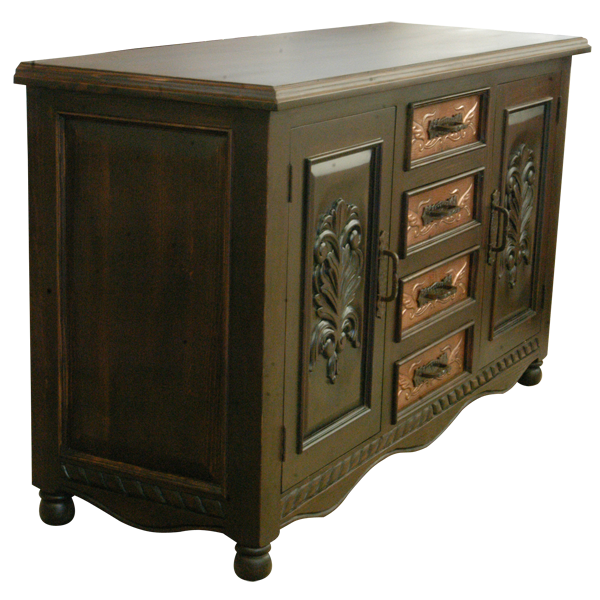 Each side of the front of the credenza has a rectangular cabinet door, and each cabinet door is adorned with gorgeous, hand carved, floral and scroll designs. Inside each cabinet door is a shelf for practical storage, and each cabinet door has a hand forged, iron, pull handle on its side. Each lateral side of the credenza has a decorative, rectangular cut panel. 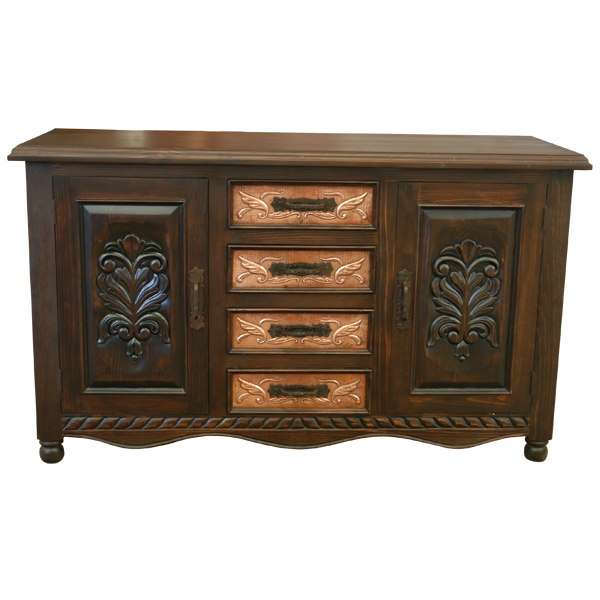 The base of the credenza has a Spanish colonial style, curved design, decorated with a hand carved, twist rope design. The credenza rest on small, hand turned feet, and the credenza is made with the best, sustainable, solid wood available. It is 100% customizable.